Joanne White posted Monday May 7, 2018. Mitchell Gee won the 2018 Queensland Sprintcar Title at Ausdeck Patios and Roofing Archerfield Speedway last night after a truly EPIC battle for the lead. Gee took control of the race from early leader Ryan Jones while the pair were navigating lapped traffic, and then fiercely defended his lead from a hard-charging Luke Oldfield. Oldfield and Gee exchanged the lead back forth numerous times in lapped traffic, putting on a completely captivating show as neither driver held anything back. The skill and professionalism shown by both drivers, as they fought each other for the Queensland Title, and the respect they showed each other, and the lapped traffic, meant that both drivers more than deserved the win. But, there can only be one Queensland Champion and this year that is Mitchell Gee. Luke Oldfield crossed the line in second while Bryan Mann, who had spent a significant portion of the race in second, faded to fourth, but made his way back around Andrew Scheuerle on a restart, two laps from the chequered flag, to snare third. Andrew Scheuerle, who for a number of laps challenged both Oldfield and Gee for the lead when they both got caught up behind a lapped car, crossed the line in fourth while Jayden Peacock rounded out the top five. The first heat of the night, heat seven of the weekend, saw Brodie Tulloch start from pole position with Cody Maroske alongside. Tulloch got the jump when the green flag flew and quickly settled into the race lead, while Andrew Corbet, from position three, followed quickly on the low line, slipping under Maroske as they raced through turn one to steal second. Brent Kratzmann raced ahead of Mitchell Gee before slipping under Maroske, with Gee on his tail as Maroske faded. Gee slipped underneath Kratzmann as they rounded turn four and approached the end of the first lap, while behind them Bryan Mann and Ryan Jones were searching for a way past Dave Whell. Gee made short work of slipping underneath Corbet and, with the Q36 set up beautifully, quickly began closing in on Tulloch and the race lead. Mann slipped underneath Maroske when the latter ran too wide in turn four, before racing underneath Whell as they rounded turn one. Kratzmann made his way underneath Corbet, while Mann closed in quickly, slipping underneath Corbet and started closing in on the back of Kratzmann in the Q2 racer. At the front of the field Tulloch was under enormous pressure from Gee, with Gee absolutely relentless as he challenged Tulloch for control of the race. While it was still very early in the night, Gee was already showing considerable speed and his focus and determination were setting him up to be a serious Title contender. Gee timed the move perfectly, racing up the inside of Tulloch through turn four, and immediately started opening a very comfortable margin over the rest of the field. Kratzmann began challenging Tulloch for second, with both Mann and Maroske on his tail. Kratzmann had a look on the inside of Tulloch before venturing to the top side, only to leave an opening on the bottom, just big enough for Mann to slip through with just over one lap left to run. Mitchell Gee got the win ahead of Brodie Tulloch, Bryan Mann, Brent Kratzmann, Cody Maroske, Andrew Corbet, Ryan Jones, Dave Whell and Randy Morgan. Heat eight started with Karl Hoffmans from pole position and Brock Dean sharing the front row. Hoffmans got a brilliant start and quickly secured the lead, opening a margin of several car lengths on second placed Dean, while Luke Oldfield, back after mechanical issues curtailed his efforts on Saturday night, challenged Dean for second, determined to make up as much lost ground as possible. Deeper in the field Peter Lack and Jayden Peacock raced up the inside of Kristy Bonsey before setting their sights on Kevin Titman, while Peacock slid underneath Lack as they rounded turn four. Dean withstood the pressure from Oldfield for a few laps, but ultimately was forced to surrender the position when Oldfield made his move on the bottom. Peacock found a way in front of Titman and while Titman fought back he was on the defensive as Lack challenged from behind. Oldfield began closing in on Hoffmans and the race lead, and while Hoffmans had built a significant margin, mechanical problems surfaced in the Q3 racer and he pulled out of the race, handing control to Oldfield. Titman continued to chase Peacock, the pair closing in on Allan Woods as the laps wore away, but it was Luke Oldfield who got the win ahead of Brock Dean, Allan Woods, Jayden Peacock, Kevin Titman, Peter Lack, Kristy Bonsey and Stewart Craig. Karl Hoffmans did not finish the race. Heat nine started with Kris Jennings and Anthony Lambert sharing the front row and leading the field to the green, with Jennings getting the jump off the start. Lambert powered around the top side, taking the lead before they entered turn one, leaving Jennings in second while Brad Ayers raced under Darren Jensen in turn two to take third. Half a lap later and Ayers had found his way past Jennings, while deeper in the field Michael Saller challenged Dan Murray for the minor places. Murray kept the advantage and started challenging Jensen for position, slipping underneath the Q75 racer in turn four, but just half a lap later both Murray and Jensen left the bottom open in turn two and that was all the invitation Saller needed, racing underneath both Jensen and Murray in one perfectly timed move to elevate himself into position four. Mark Pholi and Andrew Scheuerle argued over positions towards the back of the field, the pair soon catching Jensen and having a close battle until the race was brought under caution for the spun car of Peter Milnes. Lambert led the restart with four laps to go and Ayers and Saller on his tail and while Saller challenged Ayers for second, Pholi and Scheuerle resumed their battle mid-field. Anthony Lambert was untroubled out in front and went on to take the win ahead of Brad Ayers, Michael Saller, Dan Murray, Andrew Scheuerle, Kris Jennings, Mark Pholi, Peter Milnes, Darren Jensen and Liam Atkinson. Brock Dean started heat ten from pole position with Brodie Tulloch alongside, with Dean getting a brilliant start and quickly securing the lead, while Kristy Bonsey, from position three, was quick to race underneath Tulloch and settle into second. It was all short-lived though, with Dean uncharacteristically spinning the Q8 racer in turn two, forcing Bonsey and the rest of the field to take evasive action. Bonsey narrowly avoided the spinning car, but Andrew Corbet had nowhere to go, collecting Dean, while Kevin Titman and Dave Whell were also unlucky. Dean and Corbet were unable to restart the event, while Titman and Whell restarted at the rear of the field. Bonsey was elevated to the front row, alongside Tulloch, for the restart, and while they raced wheel-to-wheel into the first corner, Jayden Peacock, now from position three, was exceptionally quick on the bottom and managed to race up the inside of both Bonsey and Tulloch to lead the field through turn one. Tulloch fought back on the high line, but Peacock cemented his place in the lead by the time they exited turn two. Tulloch settled into second ahead of Bonsey, while Mitchell Gee and Kevin Titman battled behind them, Gee working the high line beautifully to get around the Q59 racer, with Titman fading further moments later when Whell charged through on the bottom. Bonsey stayed with Peacock for a number of laps, even having a brief look on the inside of the Q77 racer, Tulloch tried to keep Gee behind him. Unfortunately for Tulloch he ran too wide in turn four, allowing Gee through on the bottom, with Whell and Randy Morgan following in the next couple of laps. Tulloch looped the Q43 racer in turn four while attempting to regain his position from Morgan and brought the race under caution. Peacock led the restart from Bonsey and Gee, with Gee taking second less than half a lap into the restart. Morgan Challenged Whell for position, racing around the outside of the Q4 car before Whell slowed and pulled out of the event. Light mist began to fall over the venue, with Mother Nature then turning the sprinklers on just enough to make track conditions slippery and dangerous for the final few laps. Jayden Peacock got the win ahead of Mitchell Gee, Kristy Bonsey, Randy Morgan, Kevin Titman and Brodie Tulloch. Dave Whell, Brock Dean and Andrew Corbet all failed to finish the event. After a short rain delay while a couple of brief showers passed over and Ausdeck Patios and Roofing Archerfield Speedway Promoter John Kelly re-prepared the track, heat eleven rolled out with Cody Maroske to lead the field to the green from pole position. Maroske got the jump when the lights went green, quickly securing the lead ahead of fellow front row starter Kris Jennings. Brent Kratzmann got the better of Darren Jensen on the start and set out after Jennings, sliding underneath the Q81 racer as they rounded turn three, leaving Jennings to try and defend his position from Jensen, while Kratzmann set out after Maroske. Mid-field Michael Saller and Ryan Jones raced side-by-side as they searched for a way past Bryan Mann, with Saller, on the bottom, eventually getting ahead of Jones before turning his attention to Mann. Mann was patiently searching for a way past Jennings but the race was soon brought to a stop for Darren Jensen who had slowed to a stop high on the track in turn two after cutting down a right rear tyre. Maroske led the restart from Kratzmann, Jennings and Mann and while Mann quickly slipped underneath Jennings, Jones was impressive on the bottom as he charged underneath both Saller and Jennings in less than one corner. Dan Murray made his way underneath Saller, and set his sights on Jennings, but it was Cody Maroske who got the win ahead of Brent Kratzmann, Bryan Mann, Ryan Jones, Kris Jennings, Dan Murray, Michael Saller and Liam Atkinson. Darren Jensen did not finish the event. Heat twelve started with Anthony Lambert and Karl Hoffmans from the front row, with Brad Ayers and Luke Oldfield from row two. Lambert secured the lead when the lights went green, with Hoffmans in second ahead of Oldfield, who secured the advantage over Ayers in turn two. Oldfield was clearly on a mission to get to the front, slipping underneath Hoffmans as they rounded turn four for the first time and set his sights on Lambert. By the time they completed the second lap Oldfield had raced his way underneath Lambert to take control of the race, and immediately set about opening a truly massive margin on his rivals. Lambert held down second ahead of Hoffmans, while Ayers came under increasing pressure from Andrew Scheuerle and Mark Pholi. Oldfield started weaving his way through lapped traffic, now over half a lap ahead of Lambert in second, making his way in front of the back markers as if there were bonus points on how many cars he could lap in a ten lap heat race. Luke Oldfield went on to take the win, an impressive 8.612 seconds ahead of Anthony Lambert, who held on to finish second despite mounting pressure from Andrew Scheuerle. Scheuerle crossed the line in third and led Karl Hoffmans, Brad Ayers, Mark Pholi, Allan Woods, Stewart Craig, Peter Lack and Peter Milnes across the line. The Bronze Shootout saw Mitchell Gee come out on top, stopping the clock at 12.732 seconds and, together with second quickest Bryan Mann (12.806) advancing to the Silver Shootout. Kevin Titman (13.162) and Peter Lack (13.250) rounded out the Bronze Shootout finishers, just half a second slower than Gee. Michael Saller and Andrew Scheuerle joined Mitchell Gee and Bryan Mann on track for the Silver Shootout, however neither were quick enough to beat Gee and Mann. Mitchell Gee again secured the quickest time of the quartet, stopping the clock at 12.865 seconds this time, with Bryan Mann again second quickest with a 12.911 second lap. Michael Saller (12.963) and Andrew Scheuerle (12.68) were eliminated from the Shootout event. Jayden Peacock led the points going into the Dash and he and Ryan Jones joined Mitchell Gee and Bryan Mann for the Gold Shootout. This time it was Ryan Jones who secured the quickest time, 12.841 seconds, with Mitchell Gee second (13.091). Bryan Mann (13.454) and Jayden Peacock (13.562) rounded out the Gold Shootout contenders. Eleven cars hit the track for the twelve-lap B-Main, with Cody Maroske and Darren Jensen to lead them to the green. Maroske got a brilliant start and quickly made his way into the race lead, while Kris Jennings briefly challenged Jensen for second. Brodie Tulloch tried to race around the outside of Jennings as they rounded turn two, only for Jennings to fight back on the bottom to maintain third, while behind them Andrew Corbet got into the back of Brock Dean and lost several positions. Tulloch pressured Jennings for several laps before slipping through on the inside, with Randy Morgan quickly slipping up the inside of Jennings just moments before the race was brought under caution for Stewart Craig who had slowed to a stop at the end of the back straight. Maroske led the restart from Jensen and Tulloch, and while Maroske opened a sizable lead almost immediately, Tulloch began challenging Jensen for second. Behind them Brock Dean made his way past Jennings, edging closer to a transfer position, and set his sights on Morgan, who had caught Tulloch and was challenging him for third. Cody Maroske went on to take the win ahead of Darren Jensen and Brodie Tulloch, the trio, along with fourth placed Randy Morgan, all earning a transfer to the back of the Queensland Title race. Brock Dean finished fifth ahead of Andrew Corbet, Kris Jennings, Karl Hoffmans and Peter Milnes, while Liam Atkinson and Stewart Craig failed to finish the event. With thirty-five laps on the board, twenty cars rolled around for the start of the Queensland Title A-Main race, with Ryan Jones from pole position and Mitchell Gee on his outside. Jones got a brilliant start, blasting ahead of Gee the moment the lights went green, securing the lead as he beat the huge field behind him into turn one. Gee held off an early charge from Bryan Mann to settle into second, with Mann in third, while in the middle of the field Andrew Scheuerle, Peter Lack and Luke Oldfield began making their way forward. Lack and Oldfield worked the top side, searching for a way in front of Kevin Titman and Michael Saller, while Brent Kratzmann was quick on the bottom and raced up the inside of Titman, just as Lack and Oldfield were going around the top. Kratzmann, Titman and Lack were three wide coming out of turn four, with Kratzmann and Lack getting the better of Titman in turn one and left him to defend his position from Oldfield and Allan Woods, while Kratzmann got the better of Lack coming out turn two. Titman had a big look underneath Lack in turn three, as Oldfield kept persisting on the top side, with Lack soon going to the inside of Kratzmann to regain his position. Oldfield was all over the back of Kratzmann, relentless and unwavering in his determination to find a way past, yet Kratzmann refused to surrender and the pair battled for a number of laps before Oldfield finally made his way around the Q2 racer as they raced through turn three. Kratzmann challenged Oldfield for several laps, looking on the inside of the Q17 racer on a number of occasions, while Jones was working his way through the first of the back markers. Gee closed in quickly in lapped traffic, taking the lead from Jones and starting to put a couple of car lengths between himself and his rival. Jones surrendered a position to Bryan Mann a few laps later, and Andrew Scheuerle shortly after. Saller tried to follow Scheuerle underneath Jones half a lap later, but contact between Saller and Jones ended with both drivers up-side-down. Both drivers walked away, though Saller was none to impressed with Jones, with Cody Maroske, who was clipped by the airborne Saller, the only driver involved who was able to restart the race. Mitchell Gee led the restart from Bryan Mann and Andrew Scheuerle, with Peter Lack in fourth ahead of Luke Oldfield, who had started back in tenth. When the race resumed Oldfield immediately took to the high line, swiftly racing around Lack and into fourth, setting his sights on Scheuerle and holding nothing back as he searched for a way past. Unyielding in his determination, Oldfield held nothing back as he kept the pressure on for several laps before racing around the top side of Scheuerle and slipping in behind Mann and sizing up his next challenge. Deeper in the field Allan Woods was all over the back of Brent Kratzmann, who in turn was challenging Kevin Titman for position, while toward the back of the field Kristy Bonsey and Randy Morgan were challenging Mark Pholi and Darren Jensen for position. Pholi pulled away slightly, setting his sights on Brad Ayers and Anthony Lambert, getting underneath both in one perfectly timed inside passing move, while at the front of the field Gee had entered lapped traffic once more. Mann, Oldfield and Scheuerle closed the gap to Gee as they all navigated the back markers, with Oldfield steadfast in his pursuit of Mann. Oldfield had a huge look on the inside of Mann, but Mann refused to surrender, however when Oldfield tried again a few laps later a clash of wheels coming out of turn two cost Mann second, and allowed Scheuerle to capitalise and relegated Mann back to fourth. Scheuerle and Oldfield raced wheel-to-wheel, with Scheuerle stepping up the pressure with the lead now in his sights. When Gee got momentarily caught behind a lapped car Oldfield did not hesitate, racing around the outside of Gee and into the lead much to the delight of the crowd. But his time in the lead was short lived with Gee immediately firing back on the bottom less than half a lap later to regain control of the race, making it clear that this race was far from over. Oldfield charged back around the outside once more as they powered down the back straight, with Gee now under increasing pressure from Scheuerle. With lapped traffic still an added obstacle for the leaders, Gee made his way underneath Oldfield as they rounded turn two, again earning his position out in front, while Scheuerle challenged Oldfield briefly before Oldfield committed to the high line and ran two abreast with Gee for a couple of laps, each taking turns to have their nose in front. With just one lap to run they were side-by-side as the crossed the line, only for the race to be brought under caution for Brent Kratzmann and Kevin Titman who had stopped in turn two. Mitchell Gee led the restart with two laps to run and clear track ahead of him. Luke Oldfield sat in second but Gee was too quick out in front, while the battle for third heated up with Bryan Mann racing around the outside of Andrew Scheuerle with one and half laps left to run. Peter Lack, Jayden Peacock and Mark Pholi argued over fifth, with Peacock getting around Lack with one lap to run, while Dan Murray got the better of Allan Woods within sight of the chequered flag. An elated Mitchell Gee got the win and will go down in the record books as the 2018 Queensland Champion, with Luke Oldfield doing a magnificent job to come home in second, and Bryan Mann rounding out the 2018 Queensland Title podium. Andrew Scheuerle crossed the line in fourth ahead of Jayden Peacock, Peter Lack, Mark Pholi, Dan Murray, Allan Woods, Anthony Lambert, Kristy Bonsey, Darren Jensen, Randy Morgan, Cody Maroske and Brodie Tulloch. Brent Kratzmann, Kevin Titman, Brad Ayers, Ryan Jones and Michael Saller all failed to finish the event. 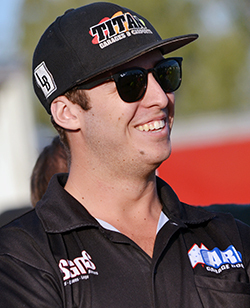 Massive congratulations to Mitchell Gee and the Titan Racing Team on the win tonight from everyone at Sprintcars Queensland, and to Luke Oldfield and Bryan Mann on their hard-fought podium results, not to mention the rest of the incredible field of Sprintcars that helped to make this weekend what it was. Thanks also to John and Kathy Kelly, and the team at Ausdeck Patios and Roofing Archerfield Speedway, and our invaluable volunteers, sponsors, family, friends and race fans for a truly brilliant weekend of Sprintcar racing. Sprintcars Queensland will return to Ausdeck Patios and Roofing Archerfield Speedway in two weeks, on Saturday 19 May 2018, for the second-last round of the East Coast Logistics Sprintcar Track Championship. Honestly, with this much talent on the local scene and the championship nearing the end, you will absolutely not want to miss this one. See you trackside!